Learning Objects in Context . Published 2009 . Publisher: Association for the Advancement of Computing in Education (AACE). 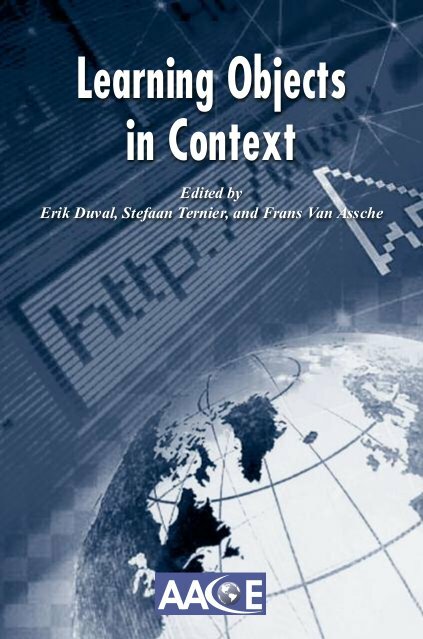 The papers in this eBook focus specifically on the context in which learning objects are deployed: this theme is quite varied and picks up on the message that “if content is king, then context is queen.” Overall, the main aim is to exploit data available about user context to: - generate metadata automatically, either during the authoring process, from the author's context, when information about the intended use is more easily available; or while the learner is working with the learning object, in order to capture his feedback, which can then be used later to help guide decisions on the appropriateness of the same object for other learners; - personalize the selection of relevant learning objects, by selecting objects that satisfy conditions that reflect the requirements of the context; and - adapt the behavior of a learning object to the specific characteristics of the context. Duval, E., Ternier, S. & Assche, F.V. (2009). Learning Objects in Context . Association for the Advancement of Computing in Education (AACE). Retrieved April 21, 2019 from https://www.learntechlib.org/primary/p/30469/.